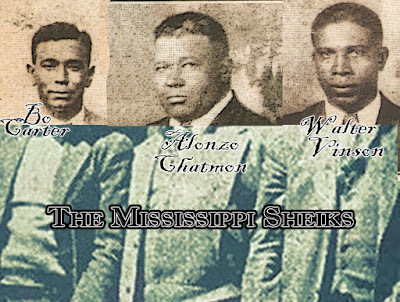 MARION — Just as the Lord God spoke to the prophets Isaiah, Jeremiah and Ezekiel, so He peered one day over the undulating hills of Lauderdale County, Mississippi, into a whistle-stop town called Marion and found Cora Fluker. They understood each other perfectly, Mrs. Fluker and God, and they struck a deal. She would sing His praises to the world and, though the fruits of material wealth would escape her through the whole of her life, He would fill her heart with the poetry of inspiration and give her soul a voice molded from the stuff of angels. Both parties have honored the agreement more or less, and two-score years later, down a red clay-inlaid road six-tenths of a mile from downtown Marion in a house and church built of discarded wood and broken dreams, Cora Fluker sings on, witnessing to a faith that has become her only anchor in a voyage through poverty and despair. A small sample of the words of Cora Fluker, unlikely prophet, just singin' about her God to anybody who'll take the time to listen. Cora Fluker is 57 years old and a uniquely Southern mesh of the frailties of illiteracy and the pride that comes with the confidence of true virtuosity. She's been singing the songs God reveals to her since she was a little girl playing a cigar box for a guitar in Livingston, Ala., helping her field-hand father keep their family whole. She explained that a "white man in a little yellow car" was one of the first to point out her gift. A long time ago, when she was but one of many poor, dust-splattered black girls on an Alabama side street, the man stopped young Cora while she was singing with her family on the side of the road. "This is a singer," he told her mother, "This is a song-writer. "Keep singing," he told Cora, "and you won't have to wear those raggedy aprons any more." Young Cora half believed him, but she knew better. The fine print of her contract with the Lord had a different set of provisions. Won't you wait for me. 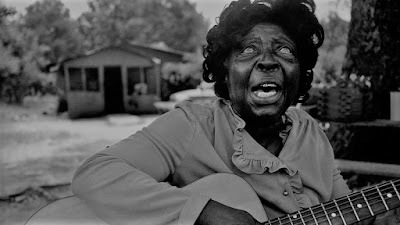 The Lord has remained in constant touch with Cora Fluker over the years, sometimes telling her the words of so many songs that she couldn't sleep for singing, strumming away the dead of night with a scratched and scarred electric guitar she bought at Mr. Mac's Pawn Shop. A childhood gift became more mission than hobby — Cora kept singing because she couldn't still her voice. She married early, moved a bit south and west to Mississippi, helped raise 13 children, 42 grandchildren and three great-grandchildren, lost a husband to death and then married another one. Her singing and composing drew admirers along the way, ranging from crowds of Marion churchgoers to musicologists from as far away as West Germany and as close as the Mississippi Arts Commission in Jackson. "God gave me the talent and I got to go with it," Mrs. Fluker said with her trademark smile. "I'm singing all the time. My voice just gets in the air." Mrs. Fluker has tried to make a decent living from her gift, but failure and bad luck remain constant visitors that often overstay their welcome. She's made crude eight-track tapes, sent them to music publishers and received papers filled with the special incomprehension writing holds for the illiterate. One crumpled, yellow slip of a contract she has kept came from a Nashville, Tenn., recording outfit named Music City Songcrafters who promised three records and a list of disc jockeys for $98. Ninety-eight dollars is a ransom fit for kings to Mrs. Fluker, so the opportunity slipped away. "I just wanted to see if I could make a hit," she said. 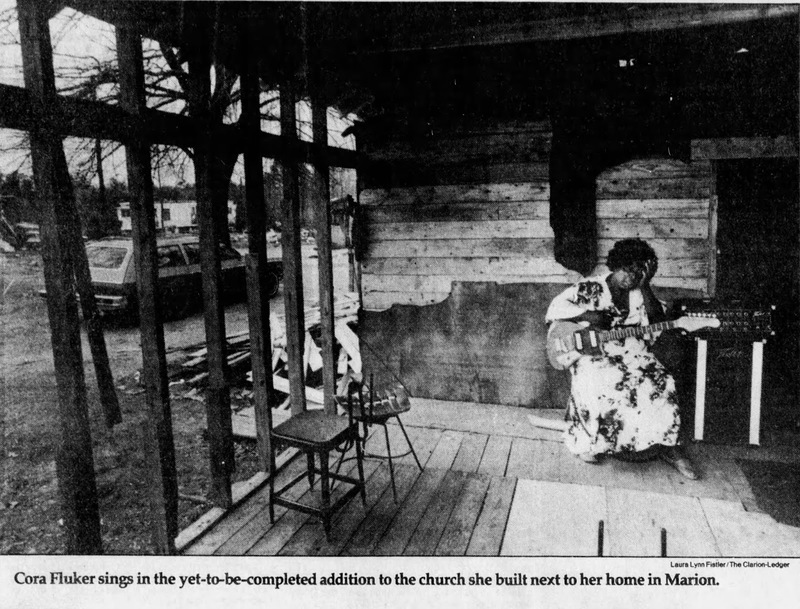 Another time she paid a recording service $135 for two re-cords and a list of disc jockeys, but her house burned down, and names and vinyl were just more components of the ashes of Mrs. Fluker's life. "I said I wasn't going to sing no more after that," she said. But it passed. "After a while there, the songs, they started coming back." Contractual obligations of an agreement covering a life-time. The Lord God has spoken. Who can but prophesy? A year ago, God told Mrs. Fluker she needed to build a chapel next to her home in Marion, and though she wasn't sure how she'd do it, she dutifully obeyed. She built it all her-self, from wood she scrounged from junk heaps, and furnished her tiny, one-room sanctuary with backless chairs, a transplanted front seat of a car, five portraits of Christ, a wooden stove, an altar made of cheap two-by-fours and a ruffled curtain sash for an altar cloth. "It's for me and my house that we serve the Lord," reads a scrawled devotion on a makeshift bulletin board. Mitchell Traylor agreed to be Mrs. Fluker's pastor, and they have services every Wednesday and twice on Sunday in what is now called Traylor's Pentecostal Chapel. The little church has become the centerpiece of Mrs. Fluker's life, the embodiment of the understanding she has with God. He promised her a chapel, and though she didn't know where to look, she found one. Her church is filled with people at every service, and now she talks of adding another room, and outside the church a wooden foundation without walls attests to her ambition. Mrs. Fluker worries that her gift has been wasted. She continues to seek recording fame so more people can hear her and the Lord's trust will be justified. "I want my singing to go out everywhere," she said. "Even over to Europe, and I know that's a long way." Mrs. Fluker calls traditional blues the devil's music, but her music flows freely from the Delta tradition, with a four-bar beat and the vocalist as instrumentalist, sparse guitar background and that ever-present sense of weariness, a fatigue unfettered even by an exuberant religious faith. When Cora Fluker sings, her past, present and future evaporate like a misty nightmare. Gone is a life working in motels and cotton fields and scrounging junk piles. Gone are the memories of pulling the plow for her husband after they had no animals left to work, of walking the long road to town in a snowstorm to get food, when it was so cold the tears froze in little rivulets, stopped in midstream as they coursed down her expressive face. When Cora Fluker sings, her eyes widen, but her vision narrows to what only she and her Maker can see. Her voice quavers and swells, she laughs and smiles, or her body may suddenly go limp, before it's racked by the sobs of religious catharsis. When Cora Fluker sings, you hear traditional culture found only in a folklorist's dream. Mrs. Fluker sings for redemption, but also for hope, for salvation, for the dreams of bursting the confines of her earthly life. Her message is simple — Someday, somewhere there is a better way. "There's too much hate in this world," she said. "Everybody's running for money. "I'll keep pressing on," Mrs. Fluker said. "I'll pray for you if you believe in me. If you listen to me, He'll hear you." When Cora Fluker sings, you hear the black man's Book of Common Prayer. I got to let that black one go on by. Cora Fluker thinks a lot about moving on. Pain, she ex-plains, "is a letter from death. He's just letting us know we're moving on." Death, to Mrs. Fluker, is a natural part of life. "Every-body got to go sometime, baby," she says, but the fact of moving on worries her, only because there are songs to be sung, words moving without form in this mind full of natively lyric language. "When I sing, I feel so good. I never know if anyone listens. But Jesus does," she said. Mrs. Fluker wants more people to listen. But if she doesn't get her wish, it won't be her first disappointment. "I got my smile," she said. "I just want everybody to smile, to be happy." Her's is a power, a self-reliance only a vanishing part of American culture can even begin to understand. She asks not for fame, but for a chance to share a vision that she never asked for. A chance to spread her smile. She will tell you, when you leave, to come by anytime. "And if I don't see you honey, I'll see you in heaven." You take that statement on its face. No questions. No hesitation. You see, Cora Fluker, unlikely prophet, has a contract with the Lord.